Transperformance 27: Rock N Roll Heaven Revisited! For 26 years Transperformance has been entertaining crowds of thousands while raising money for arts enrichment programs in Northampton public schools. Every year the event is held on the last Tuesday in August and sells out the Pines Theater at Look Park in Florence. The original concept for Transperformance was for local bands to take on a persona of another established nationally recognized act and perform or “Transperform” their bands’ style. The acts that are chosen are done thematically, such as Transperformance 22 “Food Groups” (Heather Maloney as Amy Winehouse) or Transperformance 24 “Off the Map” (Colorway as Boston) or Transperformance 23 “Beyond Bob” (Rusty Belle as Bob Dylan). Over the years Transperformance has evolved and tribute style performances have become acceptable if not the norm. We love to see groups embrace the original idea although that choice will always remain up to the artist. It would keep Transperformance fresh and interesting if more bands rolled the dice a little bit. We are always looking for new talent to bring new energy to the show. Back in 1994, The Northampton Arts Council presented Transperformance-Rock n Roll Heaven as the theme. 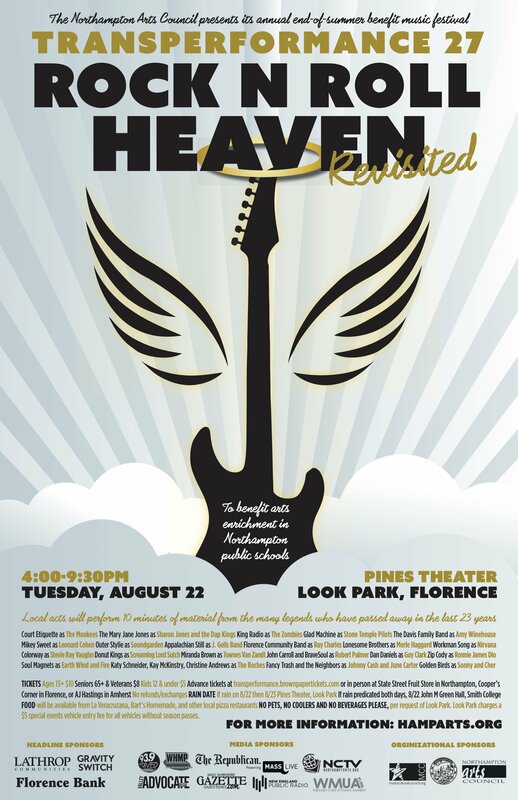 After recently losing so many legendary performers and artists, Transperformance 27 will celebrate their lives with this year’s theme, “Rock N Roll Heaven Revisited!” Local acts will perform 10 minutes of material from the many legends who have passed away in the last 23 years. Legends will range from Chuck Berry to Johnny Cash or from Michael Jackson to Sharon Jones. Bands are also encouraged to take on personas of the bands they Transperform. Acts who have the most impact and get the most out of their Transperformance experience are the ones who put the most effort into costumes and stage antics. Bands who stay in character are always crowd favorites. Save the date for Transperformance 27: Rock N Roll Heaven Revisited! on Tuesday, August 22nd from 4:00 pm to 9:30 pm. Join us as we celebrate 27 years of sailing into the sunset with everyone’s favorite end of summer event.